Moisten hands and face. Add a small amount and work into lather to cleanse skin. Rinse with water. Follow with recommended toner, serums, and moisturizer. Moisten hands and face. Add a small amount and work into lather to cleanse skin. Rinse with water. Follow with recommended toner, serums, moisturizer and sunscreen. I'm using this product everyday in the morning and I love it ! It give a smooth and refresh skin. I use it in the mornings most of the time. It's a really gentle cleanser that leaves your face feeling amazing. Really nice on the skin it's super gentle and doesn't cause irritation. This product was nice but it was very expensive (not within my budget). I probably won't buy it again. This cleanser was great for removing make up and to cleanse the face if you needed a quick cleanse. I would not use this as a nightly cleanser because I don't feel that it left my skin feeling to clean. I had to use another cleanser after this one just to get that clean feel. As a make up remover I love it. Will be buying again. I loved the Benefit Clean Gentle Cleanser! I was going through a breakout spell and this was the only thing that didn't make it worse. LOVE this cleanser for every day use. No harsh chemicals; no harsh smell. Gentle on my sensitive skin! I love this exfoliating cleanser because it is lightly scented and is gentle on my sensitive skin. It doesn't burn or dry my skin out and leaves me with glowing, supple skin. I use this every morning and evening. It is a staple on my countertop! This is a nice cleanser but I prefer Purity Clean for my skin. This is the best cleanser I've ever tried! It is super gentle but leaves my skin clean and fresh, feeling great and renewed. I absolutely love it, highly recommend it for sensitive skin. i love how clean it made my face feel! it didn't dehydrate my skin like some do. Benefit clean.....I actually really like this product. It's light, and has a wonderful faint orange smell. I'll continue using this every day and see how I feel about it after a few weeks. But so far.....love it! Gives a wonderful but gentle deep cleaning without that chemical peel feeling. It easily removes make-up and leaves skin clean without over drying or stripping. My skin tends to be on the drier side but is not sensitive. Makes my skin feel very soft, I love it. This is actually a pretty good cleanser. It does a good job at removing makeup - two pumps were enough to remove daily basic makeup. It has a nice citrus scent. And it doesn't dry out my skin, which is always a plus. I always had some pore issues with oily skin...have had consistently clear skin ever since. 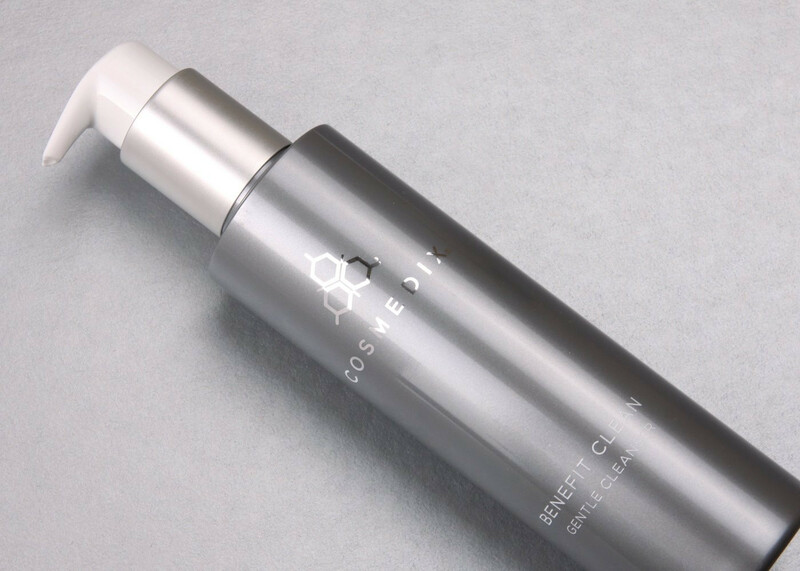 This gentle cleanser does all the things a harsher cleanser does without damaging your skin. It left my skin feeling deep cleaned and I loved it. Works great on my combination skin. My skin definitely looks clean and healthy after use. This cleanser really made my skin look clean! It was a very rich cleanser that did miracles to my skin. This gets rid of my makeup and the oil and dirt on my face from the day! Very soothing and hydrating feeling when applied. Removed makeup without irritating my skin. I love all Cosmedix products, but this cleanser has to be my all time favorite. It reduces large pores, redness, and helps my skin stay smooth and reduces fine lines as well. I use this product every day. It's never harsh or drying. It leaves my skin clean and refreshed. Love this cleanser for taking off makeup, or just the dirt and oil from the day. I teach group X, and end up cleansing my face often. THis cleanser is light enough that I can cleanse a few tiimes a day (just to get rid of sweat build up and salty feeling) and not get too dry. Love following it with the Benefit Balance! This product is awesome. Other cleansers leave you wondering if the days debris is off your face but this cleanser rocks! The only thing I would change is the pump mechanism. I have been using way to many products since forever, and have been struggling with breakouts popping up here and there. Whenever I see a new amazing product, I get way too over excited and start using it too much. Lately I have been over exfoliating my sensitive, acne prone skin with to many lactic acid toners, not being consistent at all. I have been scared that if I don't clean enough and exfoliate enough, my skin will breakout and get clogged up. This is not the case!! Key is keep it simple, use a few good products, including a good gentle cleanser. The first day I used this, my skin calmed down. The second day, my current breakouts had almost disappeared. The third day, the upcoming pimples that had been the result of over exfoliating have magically almost faded away completely. I have heard "keep it simple", "less is more" many times, and now, with a few really good products, I cannot agree more. This product is truly AMAZING. Keeps your skin so soft and smooth, gentle, clears up and keeps your skin's natural moisture intact. Absolutely fantastic. Thank you Cosmedix! This is the only cleanser that keeps my face clear and calm. Having an auto-immune disease means I must be careful not to hurt my skin as it is easy to do. This wash cleans, brightens, and strengthens my skin. Thank you Cosmedix. I love love love this product! I was using a different product and switched eight years ago- I use it at night and I use the Purity Cleanser in the am. I used to have tiny black heads all one my face and this regiment now cleared it all up!! Great product! I recently was recommended Benefit Clean to use for daily use after I received a Chemical Peel. My face was at an all-time "low". Breakouts, horrible dryness and scarring. Between the Chemical Peel, Benefit Clean and numerous other Cosmedix products, less than a month later my skin looks totally different!!! Benefit Clean takes everything off my face that doesn't need to be there but at the same time leaves my face feeling supple and healthy. This is the cleanser i have been searching for for years. I was concerned that this would be an expensive cleanser to use routinely but was pleasantly surprised that it was not only the best cleanser I've ever used, but a little goes a long way! It is well worth the price & I will continue to use it daily. I've never written a review about anything, ever!!! CosMedix......You deserve it! I have extremely hypersensitive dry skin, with terrible redness, and very bad broken capillaries. My skin looks and feels better and the broken capillaries are disappearing! Thank you CosMedix. Cosmedix Benefit Clean is definitely an excellent cleanser. Benefit Clean always leaves my skin feeling clean, smooth and hydrated. Best of all, a little bit goes a long way! so it's worth the price paid! The. Best. End of story. For years I've dealt with mild acne breakouts and poor skin. I am not able to use over the counter products, for they cause me to break out. My cosmetologist recommended I try Cosmedix. She used the Benefit Clean on my face, and I've never felt better. My skin cleared up within a week. I pair this now with Mystic (for moisture) and Affirm at night (for anti-aging). I am so happy, and feel like I don't have to wonder when my next breakout will be. I highly recommend Benefit Clean! Benefit Clean is the best cleanser I have ever used. I've been using it for over six months. After washing your face with Benefit Clean, it just feels so clean and soft, like you've just moisturized your face. It removes all of your make up with a gentle wash. This is the only facial cleanser I use now. There is no medicinal or flowery scent in this product. I have used this for two years now and I do not see myself changing to anything else. gets my face so clean and helps keep blemishes away!! My skin care pro had offered me this years ago & because of the price, I did not take advantage of it. Recently, my hormones went crazy & she said I really needed to get on this, so I bit the bullet & purchase it. My skin cleared up in less than a week & now I won't out anything else on my list! It is a great value, if you toss all the other stuff you WASTE $$ on and just buy & use this! It is very concentrated & goes a long way!! I highly suggest this TODAY! This product has changed the way I see cleaners. It never leaves my face feeling dry, just super fresh and very clean. I've told all my friends to try it. I love it! I have problematic skin, getting breakouts very easily. 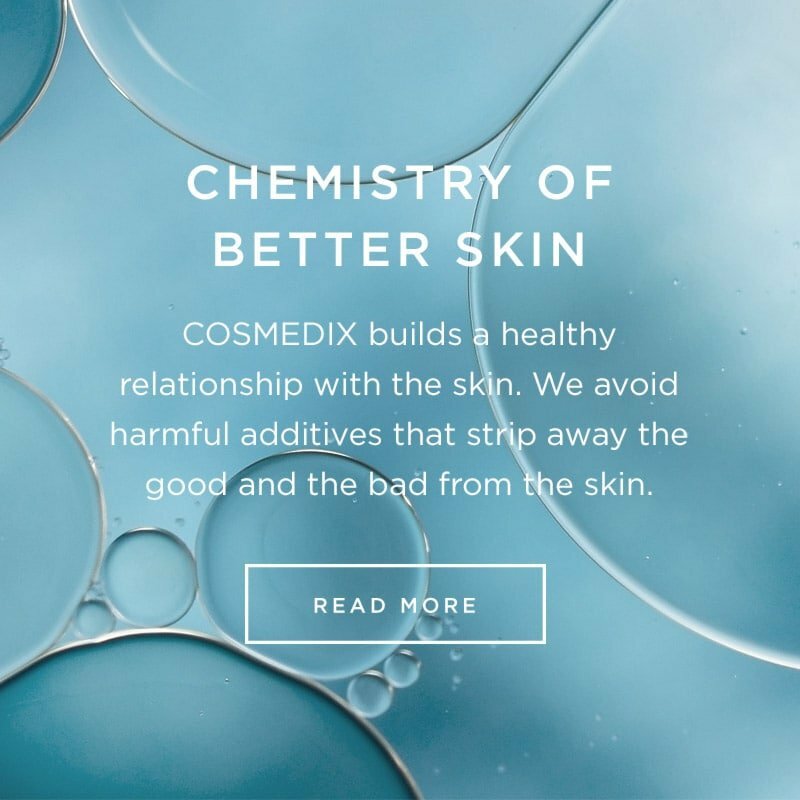 My esthetician recommended the Cosmedix line, specifically this cleaner first as an introduction to the brand/system. I immediately fell in love! My skin glowed after usage, getting better and better with each passing day. I still use this cleanser to remove makeup each night before using other Cosmedix products to improve my skin. I've used this cleanser for a few years now. It is extremely gentle on my sensitive acne prone skin while still thoroughly removing all of my makeup at the end of the day. I have sensitive skin, that can tend to be a little dry at times. I've been using Cosmedix Benefit Clean and will never, and I mean never, use any other product. It cleans my skin, doesn't leave it dry, removes my eye makeup, and it smells really good. Dear Cosmedix, don't ever stop making this product!! !